New York: Christie's, 1998. 49 pp. 221 lots. Illustrated in BW. Excellent full-page frontis reproduction of engraved frontis of Sir Isaac Newton, Philosophiae naturalis principia mathematica, London, Innys, 1726. . Illustrated Wraps. Very Good. 4to - over 9¾" - 12" Tall. 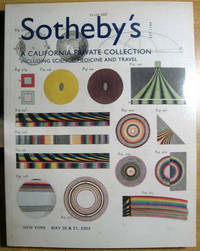 Sotheby's, 2002. 292 pp. 624 lots. Sale Total: 1,666,129 USD. More than 100 illustrations. Lots include: Acosta, José de; Adams, George; Ampère, André-Marie, and Others; Ambrogio, Teseo; Archimedes; Bacon, Francis; Bartholomaeus Anglicus; Barton, William P.C. ; Beaumont, William; Beckmann, Johann; Bernoulli, Daniel; Bishop, R. H.; Boorde, Andrew; Borel, Pierre; Boyle, Robert; Brahe, Tycho; Bruele, Gualtherus; Cardano, Girolamo; Cassini, Jacques; Copernicus, Nicolaus; Cowper, William; Cudworth, Ralph; Curie, Marie; Darwin, Charles; Davy, Humphrey; Descartes, René; Dickson, R.W. [pseud. Alexander Mcdonald]; Diderot, Denis, and Jean Le Rond d'Alembert, editors; Diophantus of Alexandria; Dodson, James; Dürer, Albrecht; Einstein, Albert; Euclid; Euclid (trans. Edmund Scarburgh); Euler, Leonhard; Eustachius, Bartolomaeus; Fabry Von Hilden, Wilhelm; Fludd, Robert; Fontenelle, Bernard; Fourier, Jean Baptise Joseph; Franklin, Benjamin; Fracastoro, Giralamo; Galilei, Galileo; Gallucci, Giovanni Paolo; Gauss, Karl Friedrich; Glandorp, Matthias; Grew, Nehemiah; Guericke, Otto Von; Hamelin-Bergeron, P.; Harris, John; Hooke, Robert, ed. ; Humboldt, Alexander Von; Hutton, Charles, George Shaw, and Richard Pearson; Ivory, James; Jacobus de Voragine; James, William; Kersey, John; Kircher, Athanasius; Laennec, René Théophile Hyacinthe; Laplace, Pierre Simon; l'Ecluse, Charles de; Lister, Martin; Martin, Benjamin; Maxwell, James Clerk; May, Edward; Mayer, Johann Tobias; Maynwaring, Everard; Mercuriale, Girolamo; Minkowski, Hermann; Moore, Jonas; Morgagni, Giovanni Battista; Mucagatta, Philippus; Napier, John; Newton, Isaac; Nightingale, Florence; Ortega, Juan de; Osler, William; Oughtred, William; Paracelsus; Pasteur, Louis; Pergaeus, Apollonius; Petrarca, Francesco; Priestley, Joseph; Rees, Abraham; Johannes Arculanus; Riccati, Vincenzo and Hieronymus Saladini; Riolan, Jean; Roesel Von Rosenhof, August Johann; Rohault, Jacques; Rouppe, Ludovicus; Ruini, Carlo; Russell, Bertrand; Salusbury, Thomas; Schott, Gaspar; Selenus, Gustavus (pseud. of Augustus II, Duke of Brunswick-Lüneburg); Solinus, Caius Julius; Sprat, Thomas; Stephenson, John, and John Morss Churchill; Sturgeon, William; Trithemius, Johannes; Vesalius, Andreas; Warren, Erasmus; Wasson, Valentina Pavlovna and R. Gordon Wasson; Weston, Thomas; Wilkins, John; Wilson, Alexander; and Charles Lucien Bonaparte; Wirtzung, Christoph; Young, Thomas; Abel, Clarke; Addison, Charles G.; Alexander, William; Bankes, Thomas; Barrow, John; Bennett, Frederick D.; Benzoni, Firolamo (trans. Urbain Chauveton); Berkley, George; Blome, Richard; Bonne, Rigobert; Bordone, Benedetto; Bougainville, Louis Antoine De; Britton, John; Bruce, James; Burney, James; Burton, Richard, Sir; Byron, George Anson, Captain Lord; Chardin, John; Churchill, Awnsham & John; Clavigero, Francesco Saverio (trans. Charles Cullen); Collins, David; Commelin, Isaac; Cook, James (trans. Jean Nicolas DÉmeunier); Coxe, William; Crèvecoeur, Michel de; Delano, Amasa; de Marigny, Augier; Diaz Del Castillo, Bernal; Dillon, Peter; Du Halde, Jean-Baptiste (trans. Richard Brookes); Emory, William; Evelyn, John; Exquemelin, Alexandre Olivier; Fer, Nicolas de; Forbes, Alexander; Freycinet, Rose de; Frezier, (Amédée François); Froissart, Jean; Gage, Thomas; Gerning, Johann Isaak Von; Hall, Basil; Hardouin, E., and W. L. Ritter; Hardy, R. W. H.; Harral, Thomas; Harris, John; Henry, Alexander; Humboldt, Alexander; Hunnewell, James; Hutton, William; Imago Mundi; Kaempfer, Engelbert (trans. J. G. Scheuchzer); Keppel, Major George (Earl of Albemarle); Kercheval, Samuel; Kircher, Athanasius; Knox, John; Kotzebue, Otto Von; Lahontan, Louis Armand, Baron de; La Pérouse, Jean François de Galaup, Comte de; Le Brun, Corneille; Lepsius, Richard; Magalotti, Lorenzo; Magnus, Olaus; Mapei, Camillo; Mayer, Luigi; Meares, John (trans. J. B. L. J. Billecocq); Mendes Pinto, Fernando; Meurs, Johannes Van; Montanus, Arnoldus (trans. John Ogilby); Morier, James; Moryson, Fynes; Neale, Adam; Nieuhoff, Jan; Ogilby, John; Osborne, Thomas; Pallas, P. S. (peter Simon); Phillip, Arthur; Portlock, Nathaniel; Purchas, Samuel; Raffles, Thomas Stamford, Sir; Ramusio, Giovanni Battista; Ray, John, Editor; Raynal, Guillaume Thomas François (trans. J.O. Justamond); Richardson, John, Sir; Sandys, George; Shackleton, Ernest Henry; Shilliber, John, Lieutenant; Solis Y Ribadeneyra, Antonio de; Somer, Jan; Sparrman, Anders; Staunton, George; Stedman, John Gabriel; Stein, Marc Aurel, Sir; Strutt, Joseph; Sykes, P.M.; Thesaurus Geographicus; Thevenot, Jean de (trans. Archibald Lovell); Titsingh, Isaac; Tyson, James L.; Ulloa, Antonio de and Jorge Juan Y Santacilla; Wilkes, Charles; Yarranton, Andrew; Aa, Pieter Vander; À Beckett, Gilbert Abbott; Ackermann, Rudolph; Aesop (and John Ogilby); Aesop (and Phaedrus); Alken, Henry; Ames, Joseph; Ames, Joseph, and William Herbert; Ashendene Press; Bacon, Francis; Beardsley, Aubrey; Berkeley, George; Blackstone, William; Blake, William; Bloomfield, Robert; Bonanni, Filippo; Burgh, J.; Burns, Robert; Cartwright, William; Cather, Willa; Cervantes Saavedra, Miguel de; Chaucer, Geoffrey; Chesterfield, Philip Dorner Stanhope, 4th Earl of; Churchill, Winston S., Sir; Clarendon, Edward Hyde, 1st Earl of; Clemens, Samuel Langhorne; Combe, William; Congreve, William; Cooper, James Fenimore; Cowley, Abraham; Crane, Walter; Dickens, Charles; Donne, John; Doyle, Arthur Conan; Du Choul, Guillaume; Dugdale, William; Dulac, Edmund; Dumas, Alexsandre; Durandus, Guillelmus; Ernesti, Johann Heinrich Gottfried; Estienne, Charles, and Jean LiÉbault; Ferrariis, Theophilus de; Fielding, Henry; Flint, William, Sir; Flores, Juan de; Foresti, Jacobo Philippo, de Bergamo; Godwin, William; Goltzius, Hubert; Grimaldi, Stacey; Grotius, Hugo; Haebler, Konrad; Hancarville, Pierre François Hugues de; Hardy, Thomas; Hawkins, John; Hobbes, Thomas; Holinshed, Raphael; Homer; Hood, Thomas; Horatius; Hugo, Victor; Hume, David; Hunter, Dard; Hyde, Thomas; Ireland, John; Ivchenko, Valerian; Jenkins, James; Johnson, Samuel; Kelmscott Press; Kingsley, Charles; Kircher, Athanasius; Lever, Charles; Levinson, Andre; Livius, Titus; Locke, John; Luckombe, Philip; Mather, Cotton; Montaigne, Michel Eyqyem de; Montesquieu, Charles de Secondat; Morand, Paul; More, Thomas; Morris, William; Nielsen, Kay; Orme, Edward; Ovidius Naso, Publius; Owen, Robert; Passeri, Giovanni Battista; Pepys, Samuel; Percy, Thomas; Philidor, F.D. 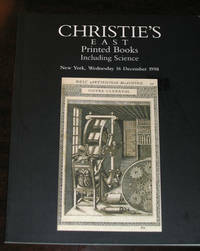 ; Piranesi, Giovanni Battista; Postel, Guillaume; Qu'ran; Rackham, Arthur; Resta, Sebastiano; Ricard de Montferrand, Auguste; Rogers, Samuel; Roosevelt, Theodore; Rousseau, Jean Jacques; Salvio, Allesandro; Sandburg, Carl; Scrope, William; Sévigné, Marie de Rabutin-Chantal, Marquise de; Shakespeare, William; Siddons, Sarah; Spenser, Edmund; Strutt, Joseph; Swift, Jonathan; Tacitus, Publius Cornelius; Thoreau, Henry David; Treizsaurwein, Marx; Valadés, Diego.. Wraps. Near Fine. 4to - over 9¾" - 12" tall. 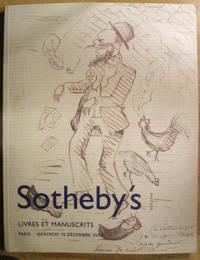 Paris: Sotheby's, Paris, 2004. 168 pp. 134 lots. Very light rubbing and bumping to corners. Highlights include: Cellulairement: 32 poèmes manuscrits autographes de Paul Verlaine which sold for 299,200 eu; A rare signed letter from Pietro Aretin to Cosme de Medici date Venise 18 Juin 1547 for 52,800 eu; A folio bible illustrated by Marc Chagall with 105 full-page eaux fortes, 48,000 eu; Cirque de l'etoile filante, Abroise Vollard with 17 eaux-fortes and 82 woodcuts by Georges Roualt, one of an in-folio edition of 215, for 42,000 eu; J.J. Rouseau, Oeuvres, La Botanique, 19 4to volumes with illustrations by Redoute apparently was not sold. . Illustrated Wraps. Very Good. 4to - over 9¾" - 12" tall. New York: Parke-Bernet, 1939. 202 pp. 618 lots. Rubbing and soiling to stiff wraps, a pencil annotation to cover. Wraps with small tears, notably at top and bottom of spine. Inside fine. 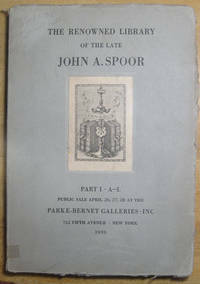 Spoor's bookplate mounted into stamped impression on cover. First editions of English XVIII-XIX century and American XIX Century Authors; Autograph Letters and Manuscripts including the Famous Emma Isola Album. . Wraps. Very Good. 4to - over 9¾" - 12" tall. New York: The Grolier Club, 1972. 56 pp. Soiling and wear to wraps, inside fine. Four illustrations of pencil drawings of The Apochrypha by Burnes-Jones. Self-charicatures of Beerbohm on front and rear wraps. 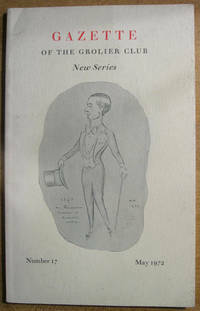 Contents: Editor's Note; Max Beerbohm by Robert Taylor; An Analysis of Queen Victoria by Robert F. Metzdorf; American Literature and Americana: A Checklist of the Exhibition from the Collection of Henry Bradley Martin; The Burnes-Jonesiness of Burnes-Jones: A Collector's Discovery of an Artist's Life and Works by Kenneth A. Lohf; Closing Notes. . Wraps. Good. 8vo - over 7¾" - 9¾" tall. Portland, Oregon: Powell's Books, 1996. 35 pp. Some creases in wraps, else fine. 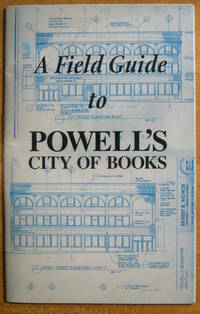 Contents: A Brief and Informal Narrative History of Powell's Books; Twenty Good Questions and Twenty Matching Answers; The Store's Services and Departments; Room by Room: A Walking Tour of the City of Books; A Final Note. ''Q: How many square feet do you have in this store? A: 43,000 retail--give or take an odd sqaure foot or two.''. Fifth Edition. Illustrated Wraps. Very Good. 8vo - over 7¾" - 9¾" tall. Cambridge, Massachusetts: Charles B. Wood, III, 1997. 86 pp. 210 items. Small chips at top and bottom of spine, probably from folding machine. A small smudge on front wraps, else fine. 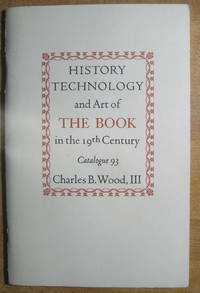 Illustrated with 16 pages of hors-text black and white plates. Fascinating detailed descriptions. . Wraps. Very Good. 8vo - over 7¾" - 9¾" tall.